Until now, each state has had its own set of student learning standards. Instruction has varied greatly from district to district, and even from school to school. That's why California Department of Education supports the concept of Common Core Standards: The goal is to provide a clear, consistent "core" of standards so all children have access to an excellent education, regardless of ZIP code. California is one of many states across the nation that have voluntarily adopted the new Common Core State Standards for English Language Arts/Literacy and Math. As schools transition from the old standards to the new Common Core Standards, the STAR testing has been suspended. (Although a pilot test will be given to students in the Spring.) During this transition many districts and schools are utilizing the MAP Tests in order to determine student academic growth. Local Control Funding Formula and Local Control Accountability Plan: What it means to TEAM Parents. MAP stands for “Measures of Academic Progress” and is a test that many school districts use to measure what students have learned in math, reading, writing, and science. Some districts give the MAP twice per year, in the fall and the spring, while other districts may give it three or four times in a school year. The MAP has replaced other standardized tests, such the California Standardized Tests, or STAR, in many districts. Many of the school-wide or grade-wide tests given to students are “traditional standardized” tests. This means that every student is given the exact same test, and then their results are compared to other students their age. The MAP is different from those kinds of tests because not all students see the same questions. 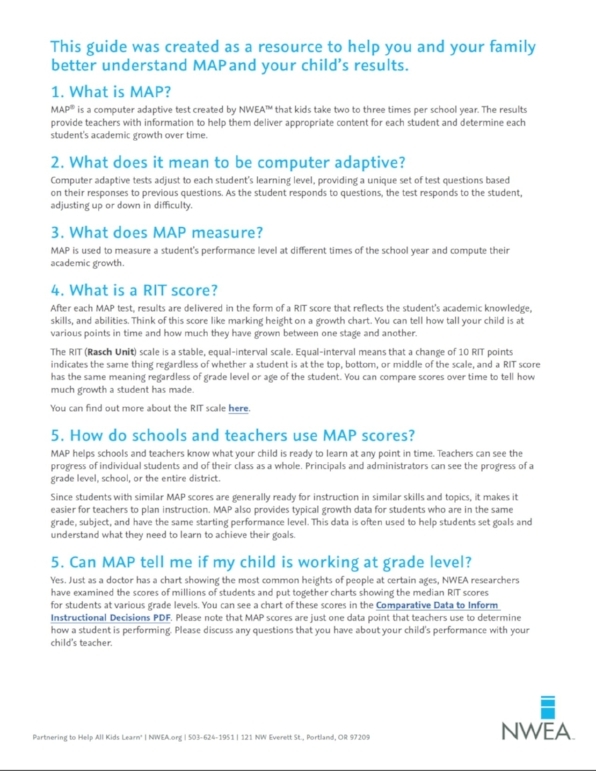 The MAP is a type of “computerized adaptive test.” This means that it can adjust the difficulty of the questions to the level of the student. The test, which has no time limit, will start with a question that matches the child’s grade level. If the student answers the question wrong, the computer will pick an easier question next. The rest of the questions will be determined by the child’s performance on previous questions. How is the MAP different from other tests? Traditional standardized tests, such as the California Standardized Tests (STAR), compare how a child performs to a large group of other students his or her age. These tests are helpful for determining whether students have met certain academic standards. However, if a child is performing below grade level, he or she might not be able to understand very many questions, and the test may be very frustrating. The results would show that the child is below grade level, but would give very little information about his or her actual learning needs or progress. The MAP is different. Because it adapts to the level of the test-taker, it can show parents and teachers the instructional level of a child and identify concepts that the child might be ready to learn. When the child takes the test again later on in the school year, the results will be able to measure the child’s progress and identify new concepts to focus on. How is the MAP scored? Since the MAP is taken on a computer, the score of the test can be given as soon as the child finishes it. The score will be called a Rausch Unit (RIT), which is a special type of number scale that measures student achievement. A RIT score will vary from grade to grade as a student grows. These scores can be used to compare the child’s performance to that of “typical” students his or her age. Using scores this way might help identify students that need some extra help. Parents who are interested in how their child’s score compares to a “typical” student their age can discuss the results with their child’s teacher. It can also be used to gage a student’s expected progress in a school year. On the reading portion of the MAP, scores called “Lexile Measures” are also given. Lexile Measures score the student’s reading ability on a scale from 5 to 2000. Scores are shown with the letter “L” after them (15L, 1050L, etc). By knowing a student’s Lexile Measure, teachers can match the child with a book that is appropriate for his or her level. For example, if a student receives a Lexile Measure of 380L, his teacher might start him with a book has been rated as having a 380L difficulty level. What can parents do to help students perform well on the MAP? • Let your child know that the test is important. • Avoid pressuring your child; let them know that his or her best is good enough. • Make sure that your child gets plenty of sleep the night before the test. • Give your child healthy, nourishing meals, especially on the day of the test. • Avoid heavy foods that may make them feel groggy or sugary foods that may make them feel hyper. • Get your child to school on time. • Visit with your child about the test at the end of the day. • Do something calming and fun with your child. • Regardless of the results, always praise your child for his or her efforts. School Accountability Report Card (SARC) California public & nonpublic, nonsectarian schools annually provide information to the community to allow public comparison of schools for student achievement, environment, resources & demographics.